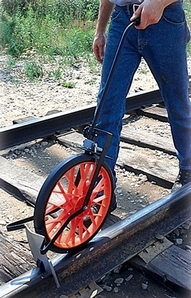 Four (4) foot circumference wheel with hard rubber tire measures up to 10,000 feet. Easy to read dial shows "feet" in white digits on black band. Rail guide keeps product on rail. Can be used on all sizes of exposed rail; on flush rail, lift up rail guide.